There is a war on wildlife. In many parts of Africa elephants and rhinos are killed with AK47’s, or more painfully with poison arrows. Their faces are removed (often when they’re still alive) for their tusks and horns. An elephant is killed every 15 minutes. In the past decade elephant populations across Central Africa have declined by 60%. All species of rhinos face the same dire future. The Western Black rhino is extinct. There is one carefully guarded northern white male rhino left in the world. When he dies, they too will be extinct. A rhino is killed every 8 hours. Canada still allows legal trade of ivory in Canada if the ivory is deemed to be pre-1989 (something which is extremely difficult to prove). This loophole here and in other nations allows new ivory to continue to be illegally traded. This year 10 Canadian cities are taking part in the annual Global March for Elephants and Rhinos to help raise awareness of the many challenges these animals face. With a large Asian population particularly in Vancouver, Canadians are in a unique position to engage the Pacific Rim (particularly Hong Kong) on issues related to the ivory trade. If the slaughter continues, these species that have roamed the world for millions of years will be extinct within a generation (15 years). Global action is needed today. The ivory and rhino horn trade are driven by the growth of the Chinese and Vietnamese middle class. The US is the second largest market for ivory. Terror groups such as El Shabaab and Boko Haraam, wreak devastation on communities, and elephant and rhino populations in order to fund terror activities. It is estimated that 70% of ivory makes its way to China to be used to make trinkets such as bracelets and amulets for worship. Rhino horn (made of keratin the same as human hair and nails) is believed to have magical properties and is used in Chinese medicine. Raising awareness of the challenges facing wildlife is critical. Without our voice, these and other iconic keystone species will be eradicated. Please tell their story, and tell the story of the global march…a group of everyday people from around the world who are united in the belief that the slaughter of these emotionally intelligent and complex animals must be stopped. 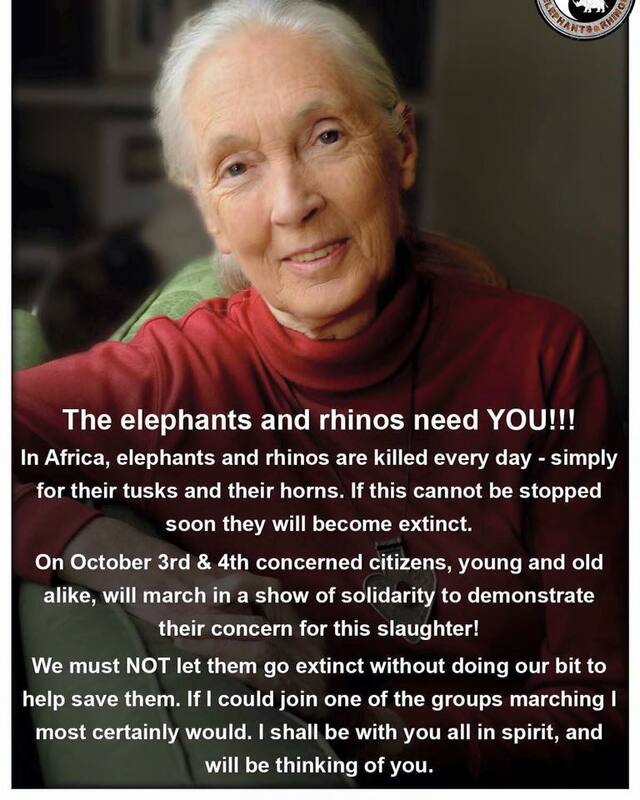 The Global March for Elephants and Rhinos, is a global grassroots advocacy movement whose aim is to end the poaching crisis against elephants, rhinos and other endangered species. Last year in 137 cities, 50,000 marched. It was the largest wildlife march to ever take place and was endorsed by the UN Sustainable Development, Jane Goodall and the David Sheldrick Wildlfe Trust amongst others. Reclassify Elephants and Rhinos under the Convention on International Trade on Endangered Species of Wild Flora and Fauna (CITES) as ‘endangered’. To stop the trade of baby elephants and other wildlife for life in captivity. The Global March for Elephants and Rhinos in Vancouver is organized and hosted by Elephanatics a Westcoast elephant advocacy group. To join the global march click here or here.